The P600 and P600+ are Airpura's top-of-the-line air cleaners. In addition to feature activated carbon filtration and a true HEPA filter, they feature TitanClean technology, a patent-pending (US patent pending #29249549) process whereby chemical contaminants including many harmful VOCs, as well as many contaminants that cause strong odors, are destroyed using a process known as photocatalytic oxidation. This technology significantly increases the range of dangerous airborne chemicals that can be neutralized safely and effectively by the filter. A reflective surface coated with Titanium dioxide (TiO2) is irradiated with UV light to produce hydroxyl radicals and super-oxide ions. Through oxidation, the hydroxyl radicals and super-oxide ions break the molecular bonds of chemicals (VOCs) that they come into contact with and break them into smaller, safer compounds. These compounds are further broken down until only harmless carbon dioxide and water vapor are left. The Airpura P600+ model features a premium titanium dioxide coated HEPA filter, thereby offering an additional 3 times the photocatalytic capacity to deal with especially heavy concentrations of airborne chemicals. In addition to activated the oxidation process of the TitanClean technology, the ultraviolet lamp produces UV-C light of much greater intensity than sunlight. The intense UV light penetrates the cell wall of the microorganism and destroys its DNA thereby rendering it incapable of causing illness. UV sterilization has many advantages over conventional methods of killing microbiological contaminants in that it is extremely effective, chemical free, produces no harmful bi-products, produces limited excess heat, is energy-efficient, is very easy to maintain, and is cost effective to both purchase and maintain. The "U" shaped UV lamp in the Airpura P600 is roughly double the length of competitor's lamps, allowing for a much higher UV dose. The generous carbon filter removes more than 250 common household chemicals, gases, and fumes, as well as organic contaminants that cause bad odors. 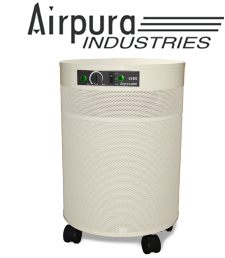 Like all Aipura air cleaners, the P600 and P600+ are equipped with a 560 cubic foot per minute variable-speed fan with a one-piece assembly to reduce vibration and noise, felt gaskets to prevent contaminant bypass (many competitors use rubber seals that off-gas VOCs), and an attractive powder-coated steel mesh housing with 360 degree intake. The Airpura 600 series has one of the highest air processing rates in the industry, however, noise level from the fan remains well below competitor's models with less air flow. Recommended Application: The Airpura P600 Series is an excellent choice for homeowners and businesses seeking a premium air cleaner with broad spectrum contaminant removal capacity and enhanced removal of airborne chemicals and VOCs. Airpura P600 and P600+ are backed by an impressive manufacturer's 5 year parts replacement, and 10 year labor repair warranty. Note, warranty does not apply to UV lamp (10,000 hour life).